There’s no doubt that social media has made keeping connected with family and friends a whole lot easier. With a timeline of all your friends’ activity, it’s easy to stay close with those you love even if you’re thousands of miles away. However, if you aren’t paying for a product, chances are that you’re the product yourself – and Facebook has made billions off of providing highly effective tools to advertisers using your information and browsing habits. Over the past couple of years, a series of leaks and whistleblowers have made it very apparent the extreme amount of information Facebook has collected from users, and they haven’t always been the most scrupulous when it comes to privacy concerns. 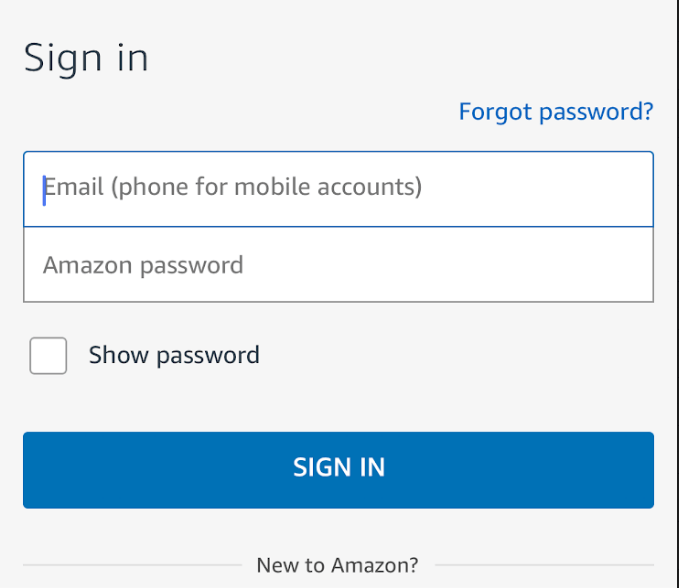 Many have started to migrate away from the service, but there are a few extra steps you may have to take beyond simple profile deactivation if you want to keep your personal data protected. Fortunately, Facebook has become pretty transparent about the type of data they’ve collected and also provide easy access to tools you can use to manage that data. 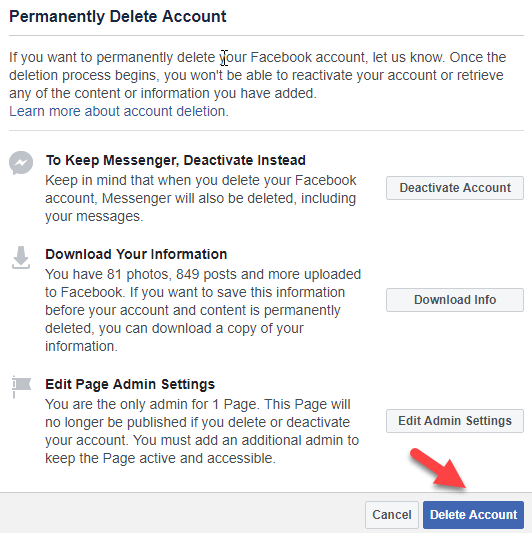 Follow the steps below to download and delete data from Facebook and reduce your digital footprint. Step 1. Log into your Facebook account on a web browser and click the drop-down menu at the top right of the screen. Step 3. On the left side of the screen, select Your Facebook Information. Step 4. Click Download Your Information. Step 5. On the next screen, click Create File. Step 6. 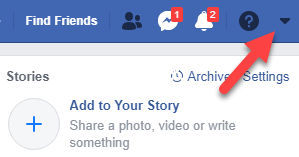 At this point, Facebook will give you a notification that your file is being processed. This can take a little while depending on how long you’ve been on Facebook and how active you have been on the site and around the web, but it shouldn’t take more than an hour or two in most cases. Once the file is finished processing, you’ll get a notification on the website that the file is ready for downloading and can then download a full file of all of the information that Facebook has collected. This is great for collecting information you’d like to save before you delete your Facebook account completely, or even if you’d just like to be able to easily sort through the content the site has amassed over the years. While we’re waiting for the file to be processed, however, we can look at a few more Facebook data settings. Step 7. 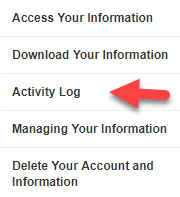 Head back to the previous page and click Activity Log. Step 8. This page is a collection of all of your activity and interactions with the website. You’ll see all your posts, comments, and even your reactions to every post on the site. For easier sorting, you can choose the data you’re interested in looking at using the Activity Log Filters at the left side of this page. Step 9. 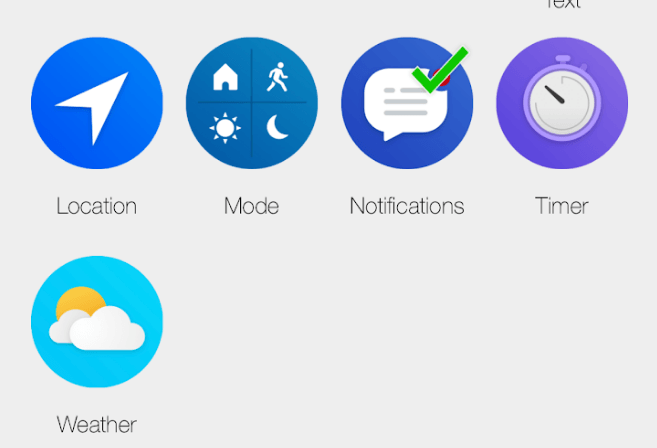 Next to any activity, you’ll see two different icons. The icon on the left allows you to take a look at who that specific entry is visible to, and the icon on the right allows you to delete specific entries from your log. This is great if there are particular photos or posts that you’d rather not be floating around the web but are okay with the data management in general. Step 10. In the event that you’d like to completely delete your account and all information associated with it, that’s an option too! 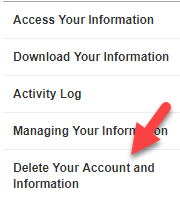 Head back to the Facebook Information screen and click Delete Your Account and Information. Step 11. The next screen gives you some information about what is going to happen when you confirm the setting, as well as some other options such as simply deactivating Facebook in order to retain access to Messenger. If you’d like to completely cut off Facebook, hit Delete Account at the bottom right of this window. Just be sure that you’re 100% positive that you’d like to remove the account and data permanently, as there’s no going back after this point in the process. 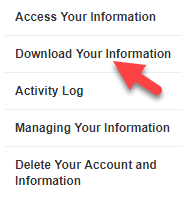 We highly recommend at least downloading your Facebook information through the process in steps 4-6 so you have a copy of any memories you’d like to keep for the future. Overall, while Facebook has certainly come across as a little shady when it comes to the way they handle their users’ data, they do give you access to that data if you’re willing to do a little bit of digging. One thing worth mentioning that many users don’t realize is that “rival” social network Instagram is also owned by Facebook. So if you’re looking to remove your data from the company’s servers completely, you’ll need to avoid using that app as well. It’s certainly inconvenient to have to cut out two of the biggest social networks on the web, but for those who want better control over the way their personal information is used, it’s well worth a couple hours of effort to take a look at the collected data and ensure you’re as well-informed as possible. Enjoy! The post How to Download And Delete Your Data From Facebook appeared first on Online Tech Tips. Smart devices have never been more accessible, and the dream of a connected home that anticipates your whims and makes your life convenient is now attainable by nearly everyone. However, many homeowners will buy smart devices and leave it at that – failing to take advantage of their technology’s true potential. Where smart devices truly shine is when they work together. Stringify is a conditional trigger system that can connect devices and actions together. You’ll specify a trigger, and then an action that will take place when that event occurs. The service refers to these pairing as Flows, since one action flows into another. In this guide, we’ll be creating a simple flow with a single trigger and action. However, Stringify flows can create multiple pairings, which allows you to group in a bunch of interactions that can work together to make your life more convenient. 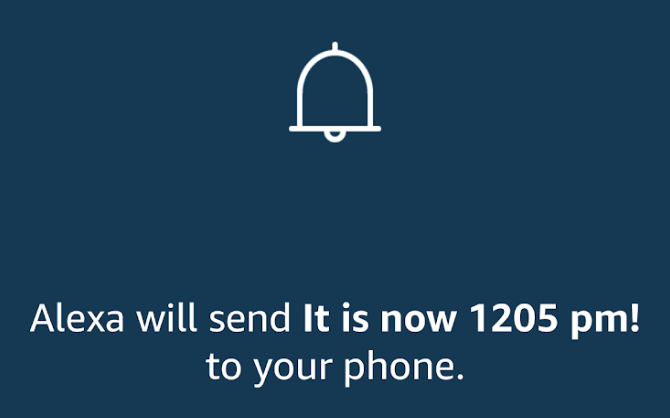 In order to ensure that everyone can follow along, we’re going to be creating a Flow that will send us a notification at a certain time. Where the app really shines, however, is in its ability to string together multiple smart devices. While we won’t be covering smart device flows, the process for creating a smart device Flow is pretty much the same. 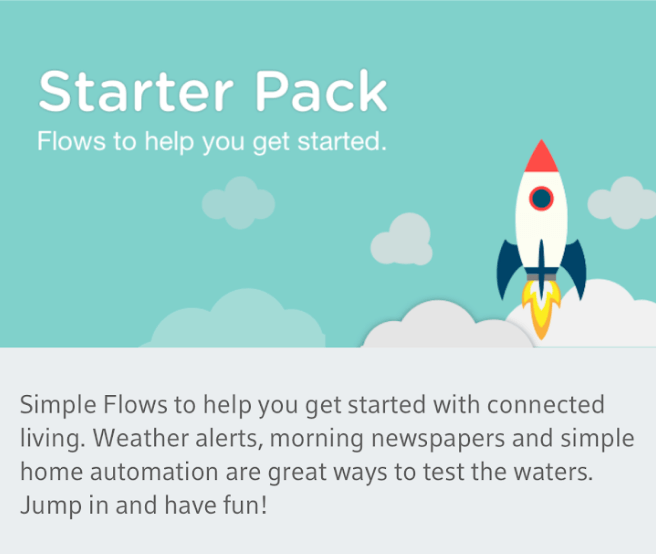 Follow the steps below to create your first Stringify Flow! Step 1. 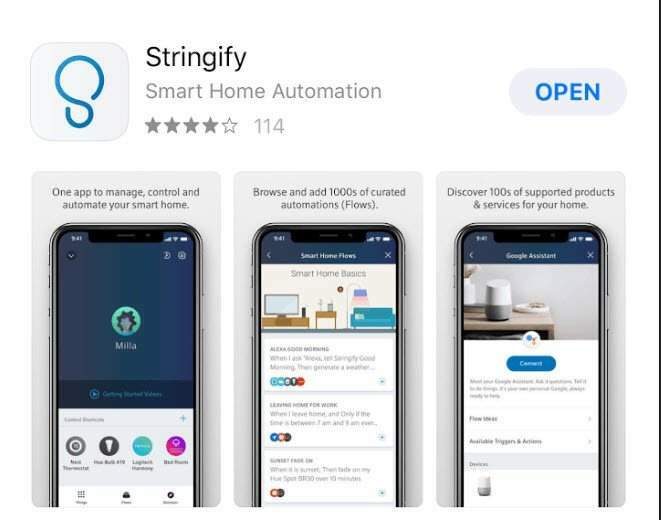 Stringify Flows are handled exclusively through the app, so you’ll need to download the program from the App Store (iOS) or Google Play (Android). 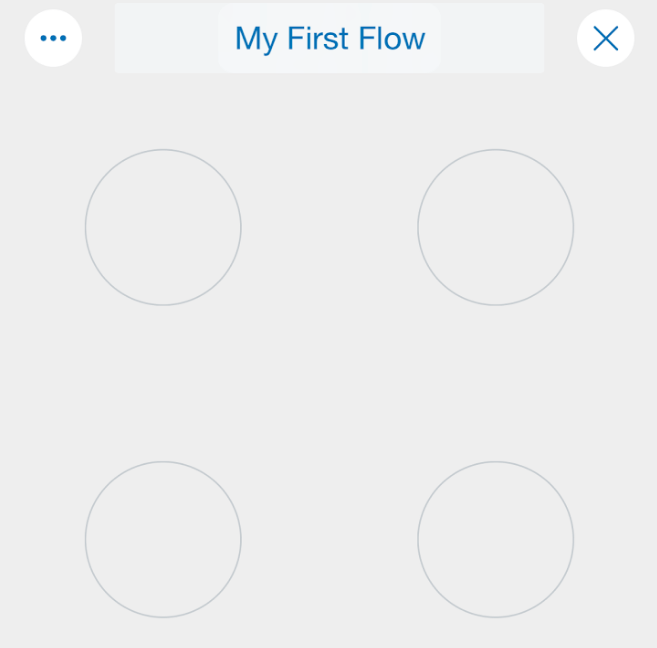 The Flow creation process should be the same regardless of your operating system, but we’ll be using an iOS device. Step 2. 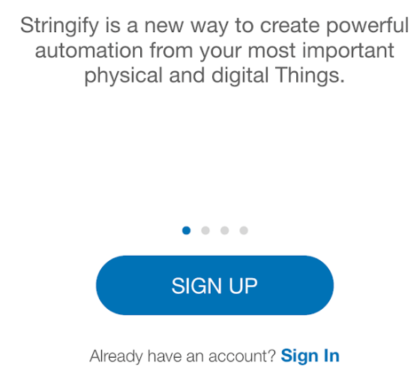 Next, you’ll want to sign up for a Stringify Account with your email and desired password. Step 3. A simple verification process will follow, sending a message to your email and prompting to click a link. If everything goes as planned, you should see a confirmation in your web browser that your account is activated and ready to go. Step 4. When you first open the app, you’ll be greeted with a basic tutorial that explains how the app works. It’s quite short, so we recommend taking a couple of minutes to swipe through so you better understand the basics. Step 5. 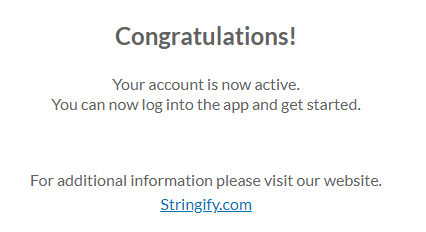 After you’ve finished the tutorial, you’ll be greeted by the main Stringify page. 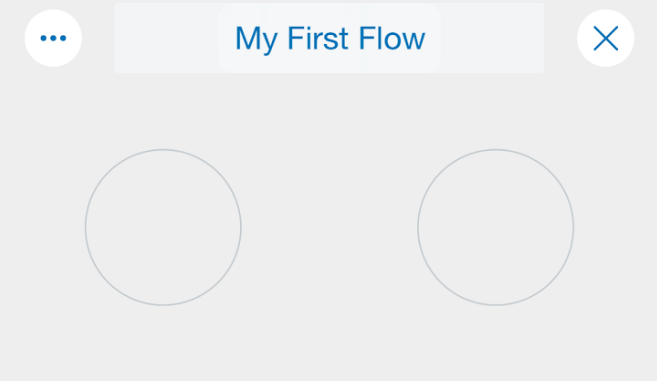 Tap the Flows button at the bottom of the screen to start creating your first Flow. Step 6. 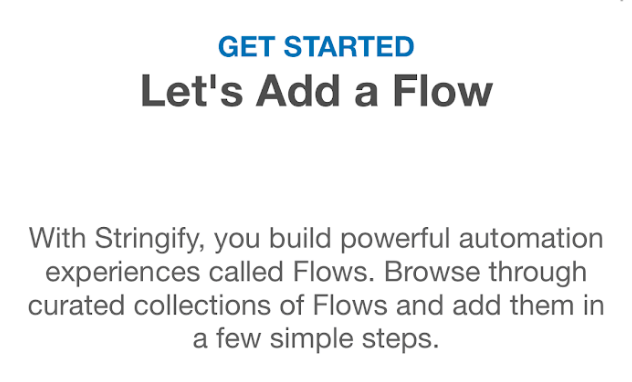 Just like the tutorial when you first signed in, Stringify will give you a quick primer on how flows work. Step 7. The next screen is where you’ll be putting the flow together. First, name your Flow at the top of the screen. Then, at the bottom of the screen, hit the Plus icon in order to add your Trigger. Step 8. Since we’ll be putting together a Flow that will send us a notification at a certain time, we’ll start by tapping Date and Time. This will stick an icon in the bottom of your Flow screen. Tap and drag it to the top left corner. Stringify makes triggers and actions easy to keep track of, since everything is represented visually. We’ll just stick the different pieces in the correct location so they interact the way we want! Tap on the icon to move onto the next menu. Step 9. The next menu gives you a few different options to choose from for the date and time. For this tutorial, we’ll just pick a specific time. However, the Sunset and Sunrise features are pretty cool as they’ll adjust dynamically based on the timing at your specific location. It’s a great way to do things like automatically turn on the lights when it starts to get dark or open the blinds to let some light in when it’s time to get up in the morning. Step 10. Fill in the details the way you please. 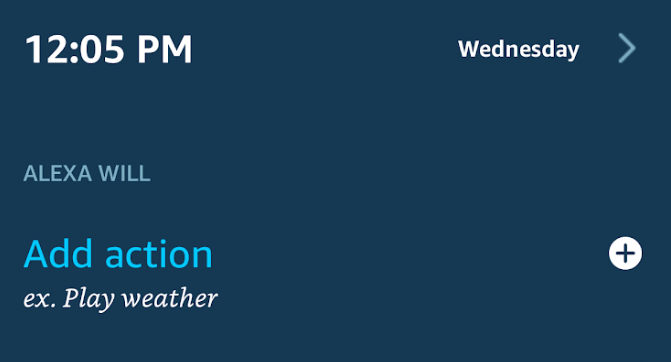 We’ll set things up to get a notification at 12:05 pm that repeats each day. Step 11. Next, it’s time to add the Notification action that will trigger each day. Once again, press the plus button. 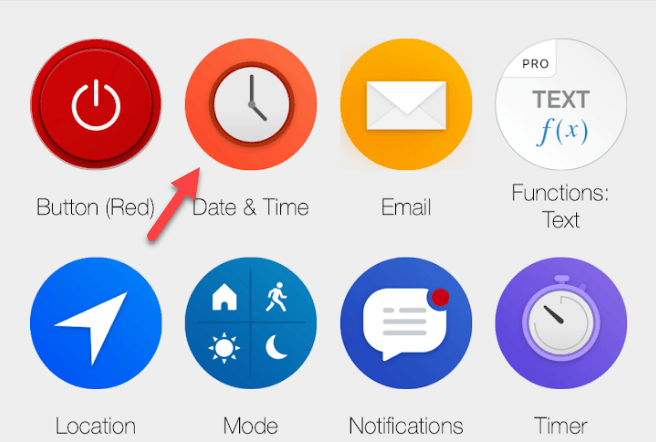 On the next screen, tap Notifications – just like we did with Date and Time. Just as before, you’ll see the icon in the dock at the bottom of your screen. Tap and drag it to the top right corner. 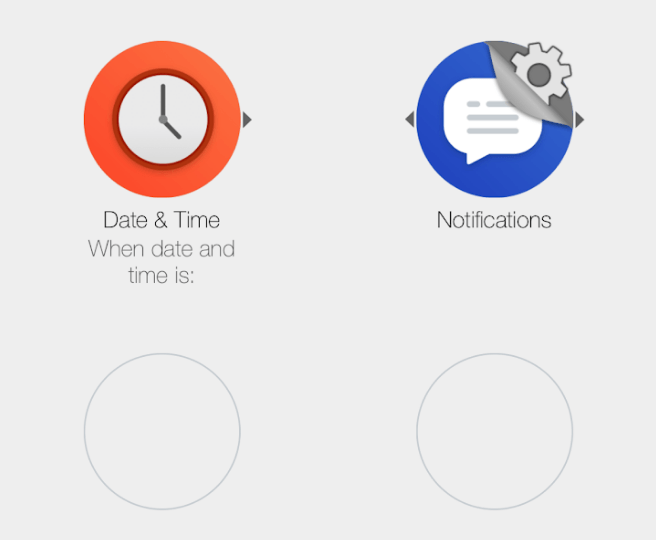 You’ll see two arrows pointing at each other, one from Date and Time and the other from Notifications. 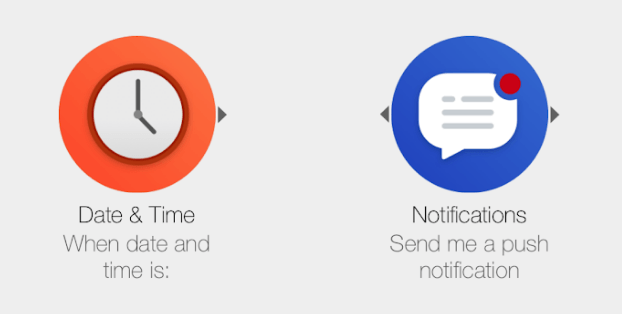 This visually represents that at the specific time, the flow will activate and trigger the notification. Tap the notifications icon to move on and input the details. Step 12. The only option we have for this step is to receive a push notification on our phone. Add that in, and then make sure you have notifications activated for the app on your device. Step 13. After confirming those details, you should be able to see the final format of your Flow. 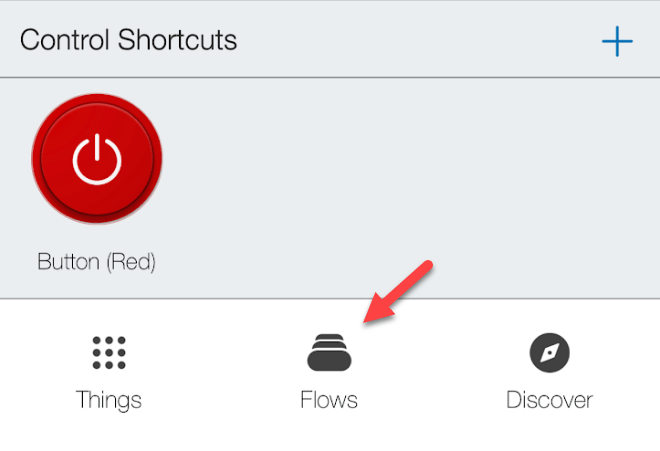 Navigate back to the main menu, and ensure that your flow is included in the list. Congratulations, you’ve created your first Flow! This Flow is obviously quite simple, but Stringify allows for quite a bit of creativity. If you’re looking for some ideas, the service has you covered. Just click the Starter Flows button at the bottom of the main screen. The next page has a bunch of Stringify Flows that you can either activate directly or use to think up some ideas to help automate your daily routine. If you’re looking for some alternatives to Stringify, IFTTT is a competing service that offers slightly different features. 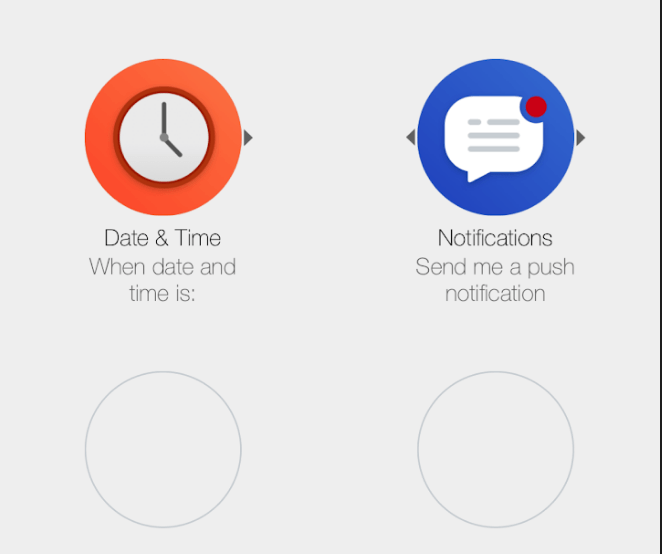 IFTTT is also generally compatible with more devices, so you may find that it’s a little easier to connect things with that tool. There are a lot of options out there, from Stringify and IFTTT to more basic utilities like Amazon Alexa and Google Home. If you’re looking to build out your smart home, make sure you don’t neglect the power that these trigger systems have to offer! Enjoy! The post The Complete Beginner’s Guide To Stringify appeared first on Online Tech Tips. Smart tech is more advanced than ever before, and the voice assistants leading the charge are utilities like Amazon Alexa and Google Assistants. Many people are aware of the basic functions that smart home hubs have to offer, but oftentimes their knowledge doesn’t extend far beyond simple commands. The truth is, Amazon Alexa is a surprisingly advanced smart home controller that can really take your tech to the next level. 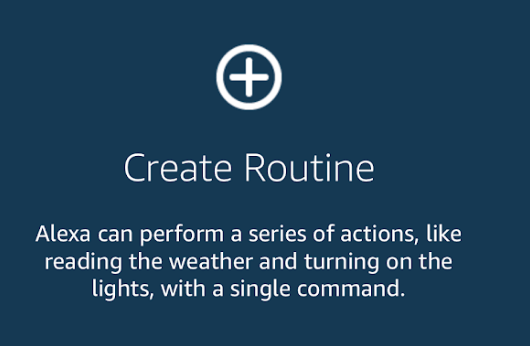 One of the best ways to take advantage of this technology is with a feature called Routines. Smart devices are certainly useful on their own, but for a truly intelligent home, you really need the technology to work together. 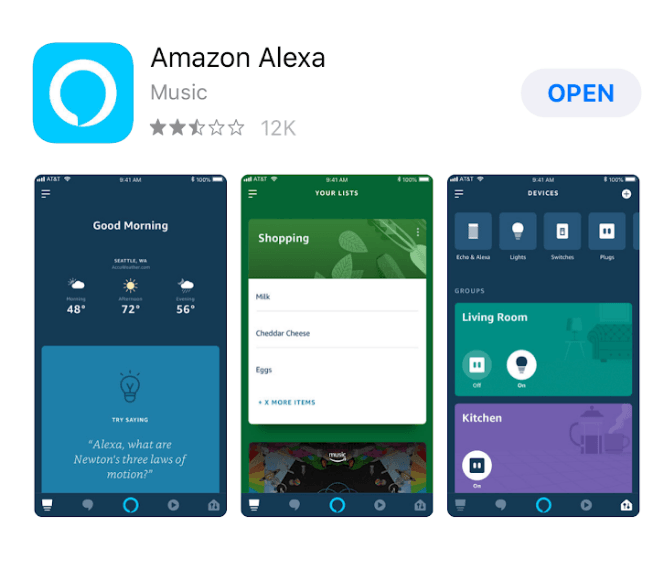 Amazon Alexa Routines are a great way to accomplish this, allowing you to control multiple devices through your Amazon Echo device with a single command. There are a few steps to follow to get a Routine up and running, but it’s not as complicated as you’d think. We’ve outlined the steps below to help you get your smart tech up and running. Step 1. If you haven’t yet, navigate to the App Store (iOS) or Play Store (Android). This guide will follow the steps on an iPhone, but the process should be the same on any Android device. Step 2. 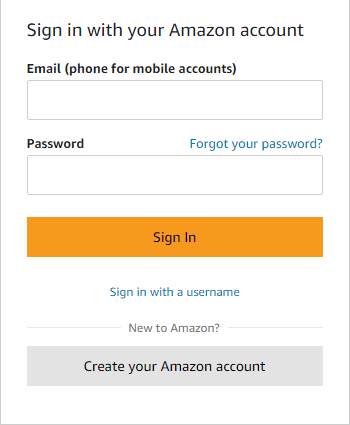 If this is your first time using the Alexa app, create and/or sign into your Amazon account. There is a short setup process where you’ll link the app to your Echo device, but the process is pretty simple and self-explanatory. Step 3. 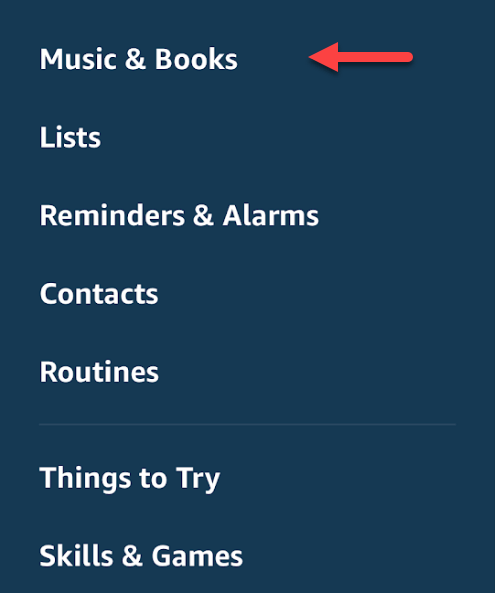 In the Alexa app, tap the sidebar at the top left of the screen to expand the app options. Step 4. Tap on Routines. Step 5. 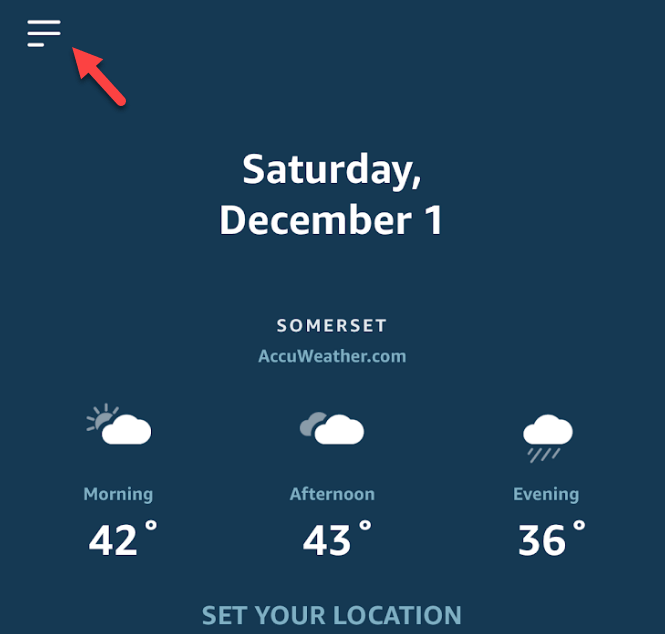 Tap on Create Routine. Step 6. 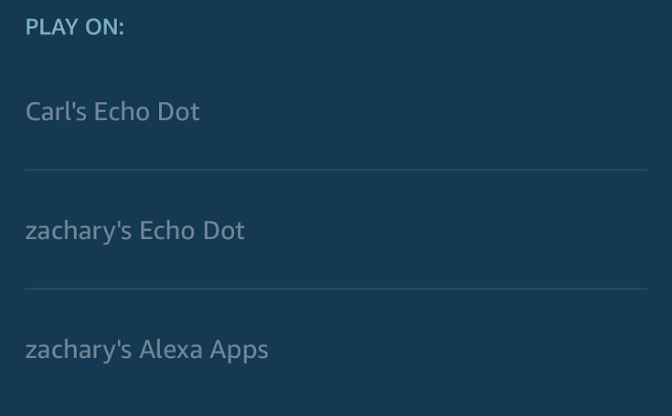 Alexa routines are conditional triggers. 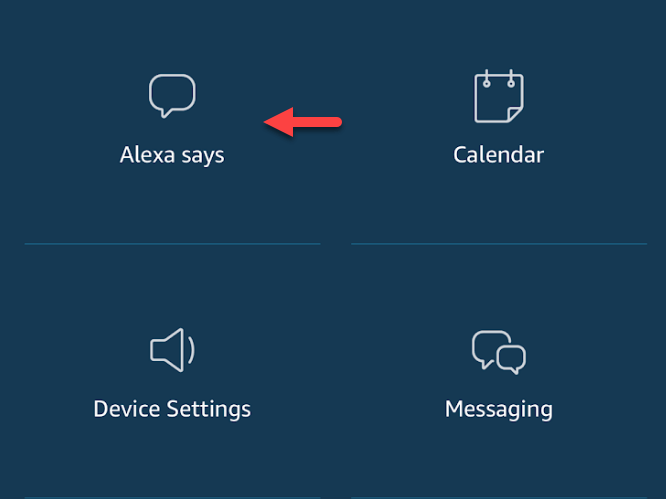 This means that the system is broken down into two separate parts: The event that will start the routine, and Alexa’s response. Let’s start by clicking When This Happens. This is very similar to how IFTTT works, which I wrote about earlier. Step 7. The next screen gives you several options for events. For smart home devices, you’d obviously choose Device. However, there are tons of different smart devices that integrate with Amazon Alexa. In the interest of providing a guide that everyone can follow, we’ll tap on Schedule for now. 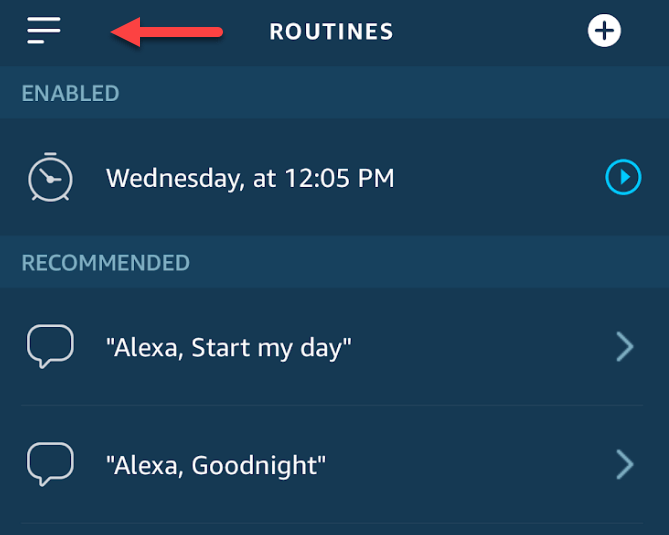 As long as your device works with Amazon Alexa and you’ve connected it to your Echo, the process for creating a routine should function similarly. Step 8. There are two options on the next screen, Set Time and Repeat. Choose the time you’d like the trigger to fire, as well as the frequency that you’d like it to repeat. We’ll set ours up to repeat every Wednesday at 12:05 pm. Step 9. Here’s where you’ll choose what happens. Tap on Add Action. Step 10. The next screen gives you a bunch of options to choose from. 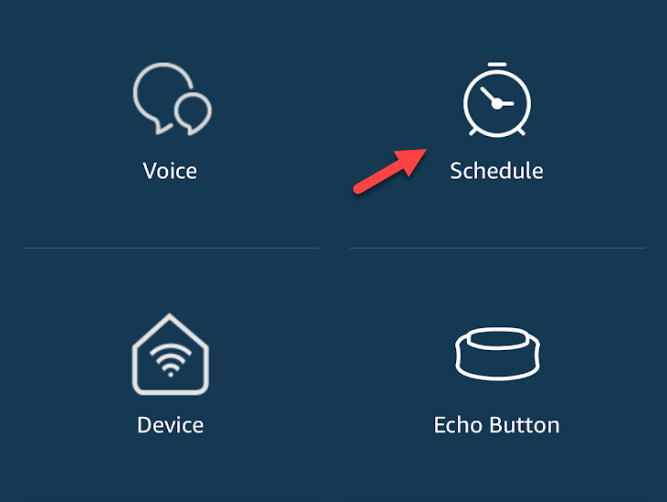 Let’s have Alexa say something at the day and time that we’ve selected by tapping on Alexa says. Step 11. Alexa isn’t exactly the most skilled comedian, but let’s have her tell us a joke anyway. Step 12. 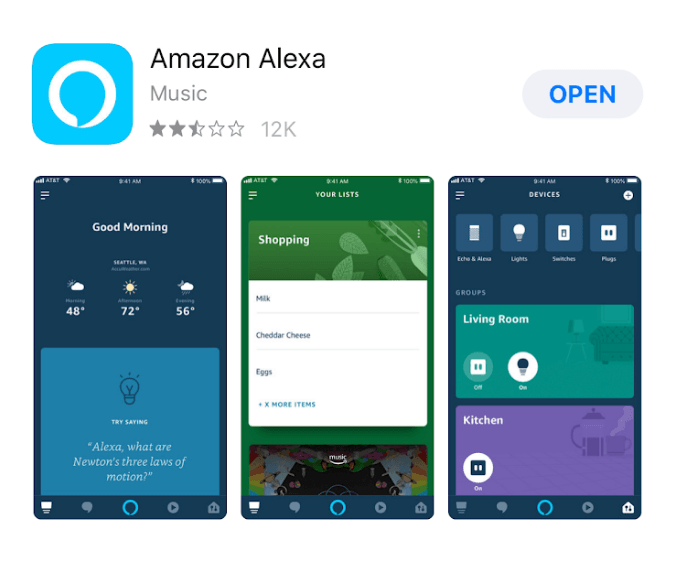 Tap Add to create the first part of your Alexa Routine. Step 13. The next screen will show you the options that you’ve selected. 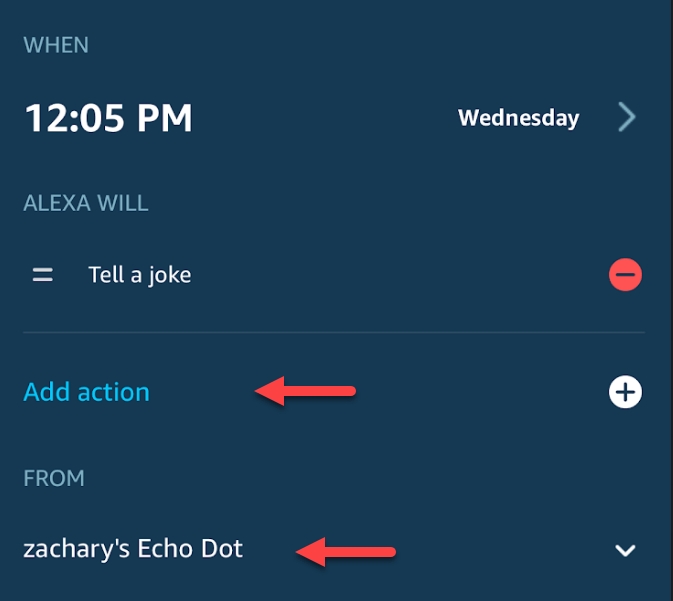 Part of the appeal of Alexa routines is their ability to combine more than one action. Let’s add another aspect to our routine by tapping Add Action. At this point, you’ll also want to choose the device that you’d like the joke to play from, which is important to keep in mind if you have multiple Echo devices. Step 14. Let’s select the Notification option so we can get a reminder on our phone as well. Step 15. Choose the text you’d like in the notification, and tap Next. Step 16. If the confirmation on the next screen looks correct, tap Add to wrap up the last part of your routine. Step 17. 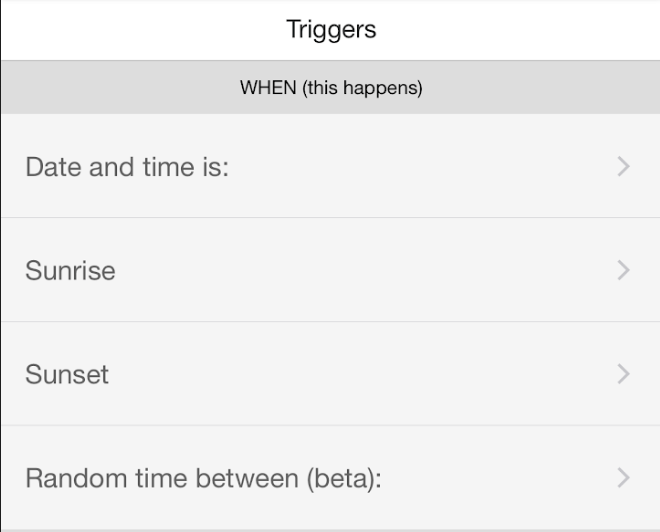 This should bring you back to a screen that shows the summary of how you’ve structured your conditional triggers. If everything looks correct, tap Create to wrap up your first Routine! Step 18. 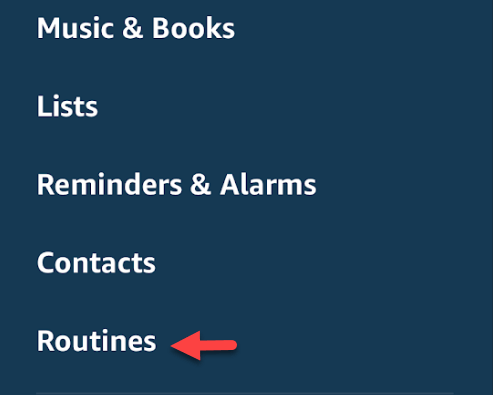 On the main Alexa page, you should now see your Routine. 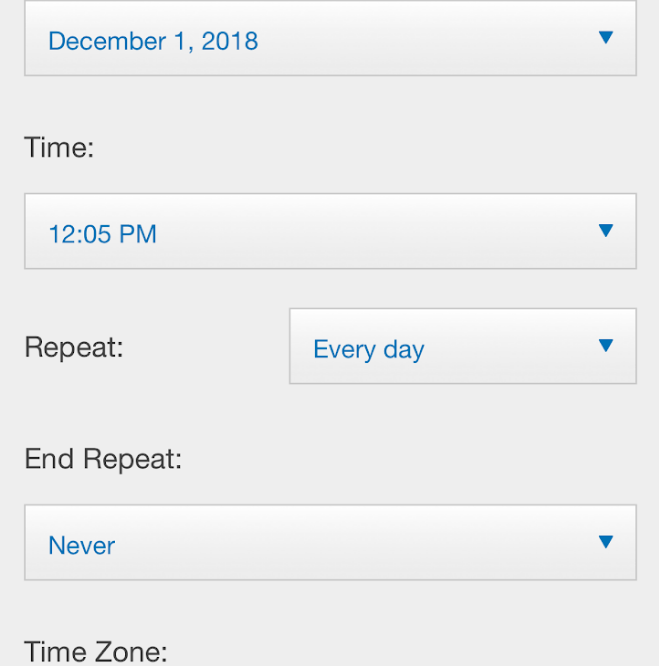 The blue arrow to the right of your routine will allow you to edit your task, with options such as changing the frequency or even deleting it outright. 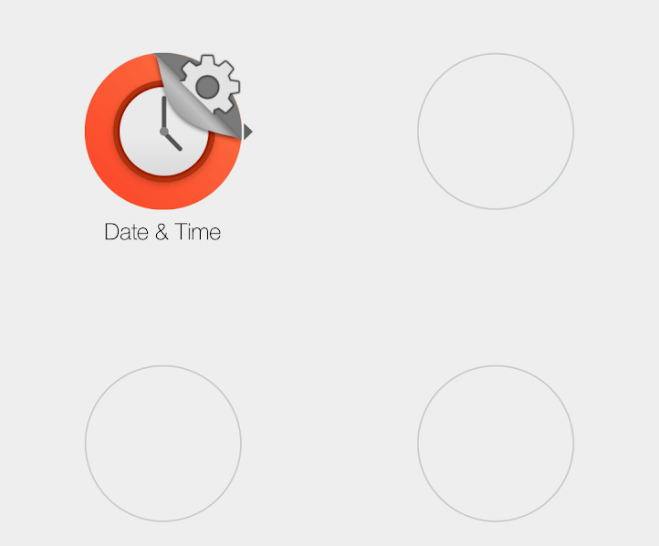 The button at the top right corner functions as a shortcut to start creating your next routine. Feel free to experiment with the various options that Alexa Routines have to offer. The Routine that we created isn’t exactly super useful and is really just to give you a sense of how the creation process works. Where the Routine feature really shines is in its ability to connect your various devices. With Amazon Alexa compatible devices, you can do things like turn on your lights and adjust the temperature when you say “Alexa Good Morning,” or dim the lights and turn on some relaxing music at a certain time so you can relax as you come home from work. 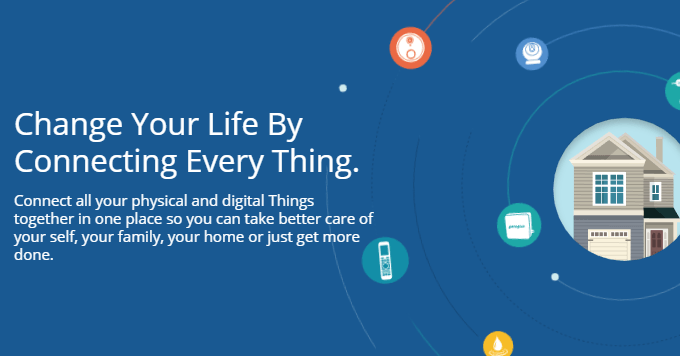 There are other smart home automation services like IFTTT and Stringify that are a little more complex and offer a lot of utility for devices that don’t work with the Echo. However, Alexa Routines are a great option for beginners to make their smart devices work together for a more convenient and intelligent home. Enjoy! 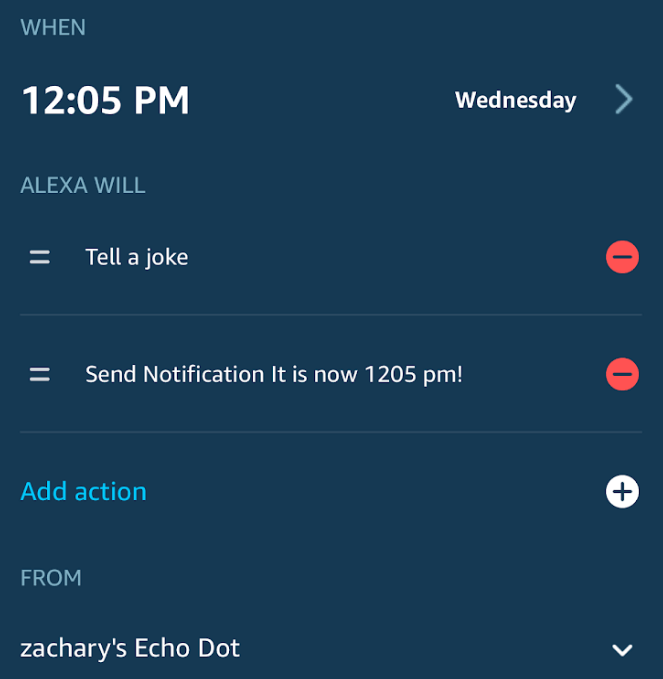 The post How to Create a Routine With Amazon Alexa appeared first on Online Tech Tips. 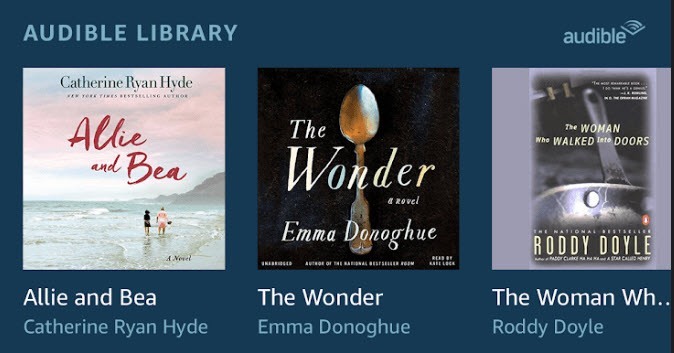 The post Listen To Audible Audiobooks Using Amazon Alexa on Your Echo Device appeared first on Online Tech Tips.